We will look at the current phasor diagram as the slip is varied, for two motors, both having the same leakage reactance, XT. One motor will be representative of the 'low-resistance' end of the scale (R2 = 0.1 XT) while the other will represent the 'high-resistance' end (R2 = XT). As before, the voltage and frequency are constant throughout. The reason for choosing total leakage reactance as the common factor linking the two motors is simply that the current loci (see below) are then very similar, and the peak torques are the same, which makes it easier to compare the shapes of the torque-slip curves. The locus of the load current phasors as the slip varies is shown on the left-hand side of Figure 7.18, while on the right-hand side the torque-slip curves are shown. remainder of the circular locus (not shown) corresponds to negative slip, i.e. generator action. The torque is proportional to total rotor power input, and the rotor power input is given by Prot = V1 I2 cos fr, where fr is the rotor power-factor angle, i.e. 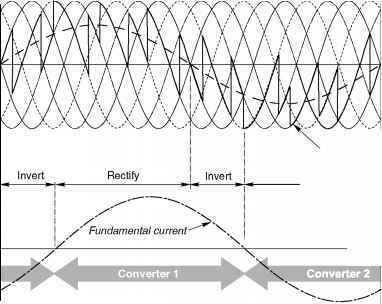 the angle between the referred rotor current and the voltage. Since the voltage is constant and I'2 cos f r is the 'in-phase' component of current, i.e. the vertical component in Figure 7.18, it follows that the torque is directly proportional to the projection of the current phasor onto the voltage, i.e. to the height of the tip of the current above the horizontal line through the point marking s = 0. This has been emphasised in Figure 7.18 by drawing the adjacent torque-slip curves to a scale calibrated in terms of the peak (pull-out) torque, the value of which is determined by the radius of the circle, as indicated in equation (7.26). 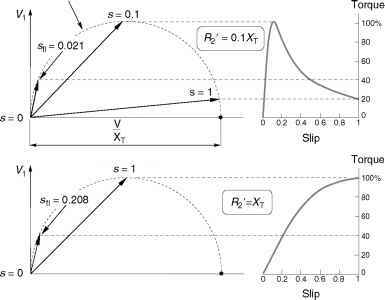 These curves confirm the finding in equation (7.25) that the peak torque is reached when the slip is equal to the ratio of rotor resistance to reactance. resistance motor, so its speed holding as the load changes is better and full-load efficiency can be correspondingly higher. As explained in Chapter 6, these widely differing characteristics indicate the need to match motor to application. For the sake of completeness, full-load conditions have also been shown, based on an arbitrarily chosen specification that the full-load torque is 40% of the pull-out torque, i.e. Tpo/TX = 2.5. With this constraint, the full-load slips and full-load currents can be calculated using equation (7.21), and thus we can draw up a table summarising the comparative performance of the two motors. The full-load points are marked on Figure 7.18: the continuous operating region (from no-load to full-load) occupies the comparatively short section of the locus betweens s = 0 (no-load) to the full-load slip in each case. As already observed, the starting and low-speed performance of the high-resistance motor is superior, but its full-load rotor efficiency is very poor and rotor heating would prevent continuous operation at a slip as high as 21% (unless it was a slipring machine where most of the resistance was external). At normal running speeds the low resistance motor is superior, with its much greater rotor efficiency and steep torque-speed curve; but its starting torque is very low and it could only be used for fan-type loads, which do not require high starting torque. As explained in Chapter 6, the double-cage rotor or the deep-bar rotor combines the merits of both high- and low-resistance rotors by having an outer cage with high resistance and relatively low reactance, in which most of the mains frequency starting current Xows, and an inner cage of relatively low resistance and high reactance. The latter comes into effect as the speed rises and the rotor frequency reduces, so that at normal speed it becomes the dominant cage. The resulting torque-speed curves - shown typically in Figure 6.9 - offer good performance over the full speed range. Equivalent circuits for double-cage motors come in a variety of guises, all using two parallel rotor branches, with a variety of methods for taking account of the significant mutual inductance between the cages. Treatment of double-cage induction motor circuits is best left to more specialist textbooks.